Vancouver, British Columbia, July 26, 2016 – Noka Resources Inc. (NX: TSX-V) (2NKN: FSE) (NOKAF: US) (the “Company” or “Noka”) is pleased to update shareholders that, pursuant to the June 29, 2016 press release regarding the Duxbury Lithium Property, Quebec (the “Property”), a prospecting crew has been mobilized onto the Property. 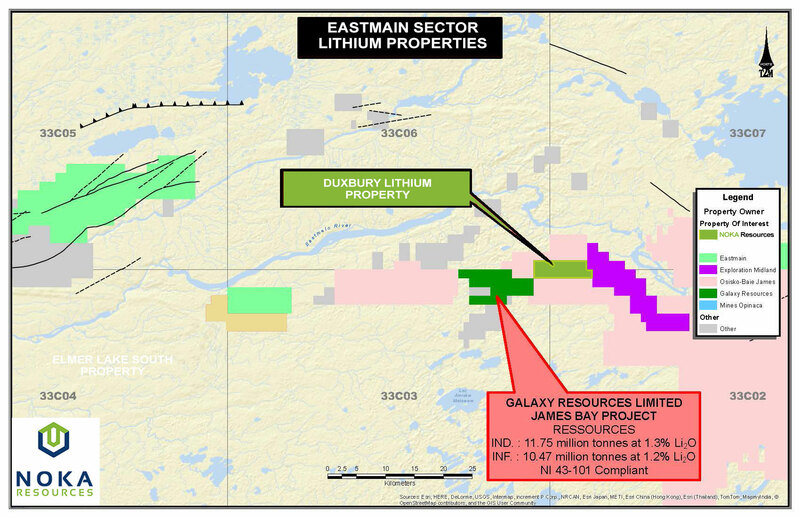 The Property is located in the James Bay Region, 2 km south of the Eastmain River and adjacent to Galaxy Resources’ James Bay Project that has reported an indicated and inferred resource of 22.2 million tonnes grading 1.28% lithium oxide (Li2O) contained in a spodumene bearing pegmatite. Noka has mobilized a prospecting crew to the Property to systematically sample all outcrops and to map, trench, complete limited geophysics and strip any prospective areas discovered. All samples will be sent to an accredited laboratory for ICP whole and trace element analysis. The results of this initial program will be used to develop the next exploration program which will include a diamond drilling. Noka intends to immediately commence a surface sampling program of its Columbus Lithium Project, located in Esmeralda County, Nevada. The survey will include up to twenty hand auger holes to test for the presence of lithium, potassium, boron and other commercial elements in the surface layer. ‎Concurrently, the Company is applying for drill permits to evaluate any lithium bearing brines at depth.